(CNN) -- A well-known West Memphis, Arkansas, physician was in critical condition Wednesday night after he was injured in a bombing that occurred as he was getting into his vehicle to leave for work, police said. Dr. Trent Pierce is well-liked and a pillar of the West Memphis, Arkansas, community, sources say. Dr. Trent Pierce, 54, a family practitioner who serves as chairman of the Arkansas Medical Board, lost his left eye in the blast about 8 a.m. at his home, West Memphis Police Chief Robert Paudert told reporters. Doctors operated on his right eye in hopes of saving it, Paudert said, and also removed shrapnel from Pierce's abdomen. Pierce underwent another surgery in the evening in which doctors were removing more shrapnel from his neck, Paudert said. He was at the intensive care unit Wednesday night at the Regional Medical Center in Memphis, Tennessee, known as the MED. The blast, which was heard a mile away, occurred as Pierce was leaving his home at his usual time, Paudert said. His wife was in the house, heard the explosion and ran out to find Pierce lying in a flower bed six feet from the vehicle, authorities said. A passerby called 911. Dr. Scott Ferguson, a friend and neighbor who is serving as the Pierce family spokesman, told reporters Pierce apparently found a spare tire in front of the vehicle Wednesday, and as he was warming up the car, went to move it so he could leave his driveway. As he was doing so, the bomb -- under the vehicle -- exploded, Ferguson said, adding he did not know what role the tire played. Paudert told CNN he had spoken with officials at ATF, which is the lead investigative agency, about the tire, but declined to comment on the issue. Pierce was stabilized at a local hospital before he was flown across the Mississippi River to the MED, officials said. Paudert credited staffers at the local hospital with saving his life. "Every one of the surgeons who has come down has been excellent, keeping us informed and telling us what's going on," Ferguson said. "The news has been better with each report." He said he saw Pierce at the local hospital and initially was not optimistic about his chances, but as of Wednesday evening was "quite optimistic that he is going to survive and do well ... it's going to be a long process. It's not going to happen overnight, but we are very optimistic and thankful." A plastic surgeon told family and friends Pierce's burns "look much worse than they actually are," he said. Lowery told reporters: "We have no doubt this was a criminal act." Ferguson said he had no idea who would have wanted to hurt Pierce or why. "There are crazy people in the world, and what triggers them, I have no idea," he said. "He's loved by everyone," said Paudert of Pierce. "He has a very large practice, particularly of elderly people that depend on him for their health." He said Pierce had no known complaints or threats against him. "There is absolutely no motive as to why someone would want to plant a bomb on his car." Initial indications were that foul play was not involved, Paudert said earlier, and police thought the blast might have resulted from a malfunction of some sort. However, ATF agents were able to find evidence of an explosive device, he said. Eighteen ATF agents from three states were at the scene, Lowery said. But the West Memphis police chief promised to remain involved in the investigation, too. Whoever planted the bomb has "injured someone that's loved in this community, and my physician," Paudert said. "I'm going to show personal attention to this." The board was scheduled to meet Thursday in Little Rock, according to its Web site. Little Rock, the Arkansas capital, is about 125 miles west of West Memphis. 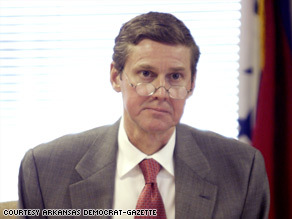 Paudert said Pierce was scheduled to attend board subcommittee meetings in Little Rock on Wednesday, but police do not know whether that was linked to the bombing. Ferguson described Pierce as active in the community and said Pierce and his wife have two grown children -- one in law school and one who works at a bank. West Memphis and Memphis, Tennessee, are separated by the Mississippi River. West Memphis had about 28,000 residents as of 2006, according to the U.S. Census Bureau. Local and federal officials urged anyone with information to contact law enforcement agencies. The ATF tip line is 888-ATF-BOMB. CNN's Kathleen Shahriari and Kevin Bohn contributed to this report.